BAD CREDIT CAR EQUITY LOANS Borrow up to $35,000 with Fast Canada Cash! Do you need money instantly but are unable to get traditional financing? Do your friends and family that are also unable to lend you the money you need? Then consider a bad credit car equity loans! Most people are not exactly sure what they are. What exactly is a Bad Credit Car Equity Loans? Firstly, let’s just try to understand how bad credit car equity loans work. A bad credit car equity loan is a loan in which a lender gives you money based on the equity in your vehicle. Your clear car title is used as collateral or security for the loan in order to lend you money. Lenders require entire details of your vehicle including the make, condition, mileage and most importantly the status of your title. The amount you’re able to borrow will depend on the market value and also overall condition of your vehicle. Easy Payment Plans and Minimal requirements for Bad Credit Car Equity Loans. In order to loan with Fast Canada Cash, make sure you have proof of permanent residence, a valid Canadian driver’s license; a clear lien-free car fully paid in your name and also must be inspected prior to receiving your loan. Our monthly payments are flexible and convenient. We also offer longer loan terms up to 4 years. Keep Driving Your Car For The Entire Duration Of The Loan! No need to worry about making alternate arrangements about your car. For the entire duration of the loan, you can continue driving your car as normal. We simply use your car title as collateral for the loan, even your credit score isn’t a factor when you loan with us! 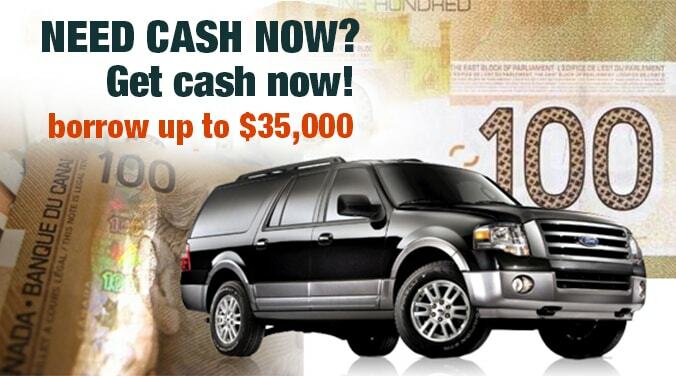 If you have any questions feel free to contact Fast Canada Cash today. You can apply online or call us (toll-free) 1-(888)-511-6791 to get started today. Our experienced staff is here to help you anytime you need.